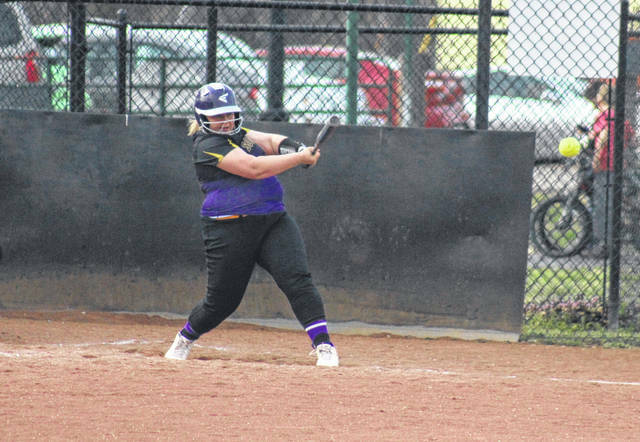 SHS junior Caitlynn DeLacruz singles to left field for part of hitting for the cycle, during the Lady Tornadoes to a 14-4 victory on Thursday in Racine, Ohio. RACINE, Ohio — The kind of offensive night that you dream about. 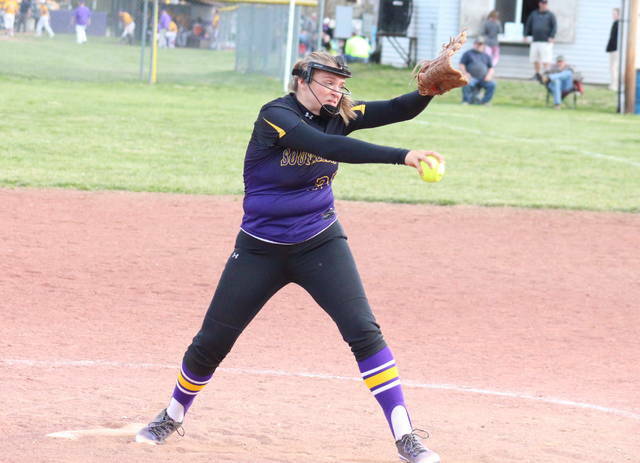 The Southern softball team pounded out 14 hits on its way to a 14-4 victory over Tri-Valley Conference Hocking Division guest Miller on Thursday in Meigs County, with SHS junior Caitlynn DeLacruz hitting for the cycle and driving in half of the Lady Tornadoes runs. Southern (4-4, 2-4 TVC Hocking) trailed 2-0 after the top of the first inning, but tied the game before the first out in the bottom half, as DeLacruz doubled home Cierra Whitesell and Kayla Boyer. A two-out Avery King single brought Brooke Crisp around to score, and then Baylee Grueser doubled home King to give SHS a 4-2 edge. 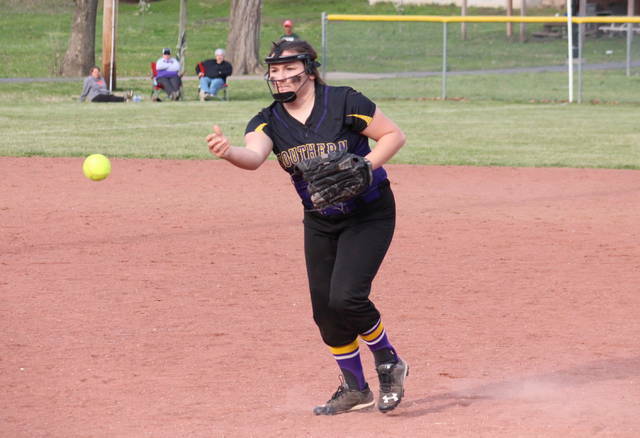 Following a scoreless second frame, the Lady Tornadoes plated two runs with two outs in the bottom of the third, as King singled home Crisp and then scored on a triple by Grueser. 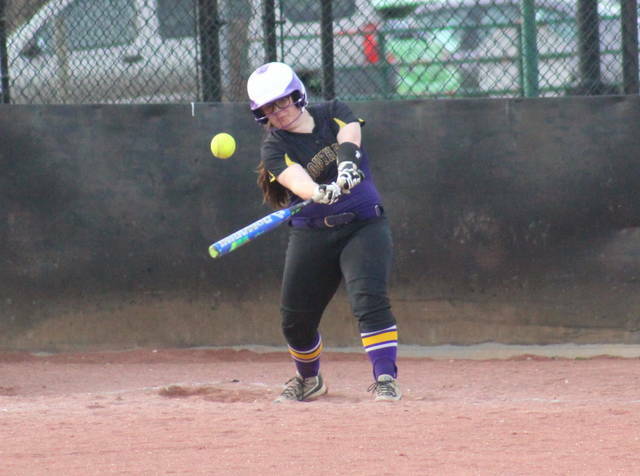 The Lady Tornadoes doubled their lead in the bottom of the fourth inning, scoring four runs on three hits to make the margin 10-2 headed into the fifth. The Lady Falcons ended a three-inning drought with a pair of runs in the top of the fifth, but Southern slammed the door on the 14-4 mercy rule win with a four-run bottom half, capped off by a three-run home run by DeLacruz. Abby Cummins was the winning pitcher of record in a complete game for Southern, striking out eight batters, walking two and hitting one, while allowing four runs, two earned, on six hits. Agriest took the setback in 4.1 innings for the guests, giving up 14 runs, 10 earned, on 14 hits, while striking out four. Leading Southern’s offense, DeLacruz was 4-for-4, with a home run, a triple, a double and a single, to go with one run scored and seven runs batted in. King was 3-for-3 with two runs and three RBIs in the win, Grueser was 2-for-3 with a triple, a double and two RBIs, while Whitesell went 2-for-4 with a three runs and one RBI. Jordan Hardwick contributed a double and a run to the winning cause, Kayla Boyer added a single and three runs, while Sydney Adams singled once and scored once, and Crisp scored three times. Agriest and Chappeka led Miller, each going 2-for-3, with Agriest scoring a run. Perani had a hit, a run and an RBI for the guests, while Joseph singled once and scored twice. Both teams committed a trio of errors in the contest. The Lady Tornadoes left three runners on base, two more than the Lady Falcons. SHS and Miller will meet again on April 22 in Perry County. After visiting Belpre on Friday, Southern will have a non-conference bout at Hannan on Monday.